When it comes to drinking, I tend to be a beer girl (Note: my lack of drink recipes on the blog). Since spending last summer in California and studying abroad in Rome, I've also gotten in to wine. When its hot and humid, sometimes a beer or wine just won't do. If I'm going to drink anything with alcohol in it, it's gotta be light and refreshing. Enter-----Sangria. It's fruit + wine and nice and cold to cool you down. 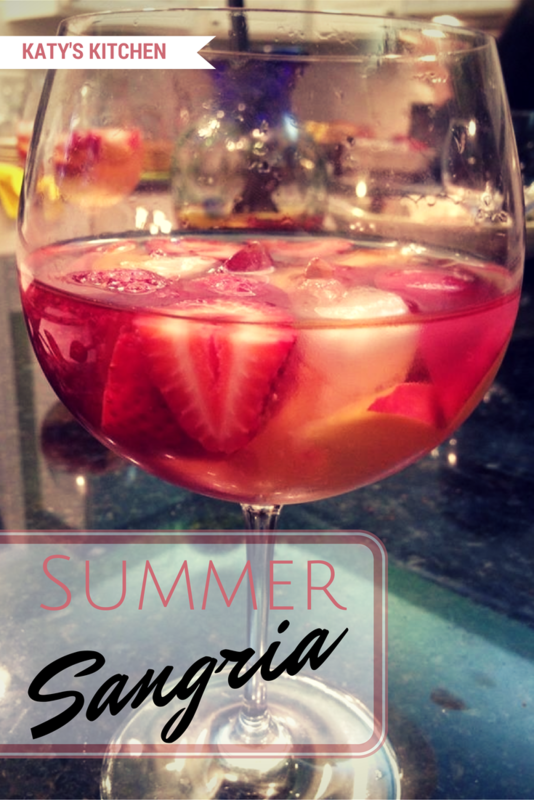 Its a great summer sipper whether before a meal or after (or even during). I like this drink during the summer months because it shows off the best fruit of the season. Make this the next time you're having friends over as a tasty way to savor the summer. 1. Mix riesling, juice, and schnapps together and stir. 2. Combine all fruit in the drinks. Let cool in fridge for a few hours (or in the freezer for one hour) before serving. 3. Add ice and serve! If I'm going to be having 4 or less people, I will cut the recipe in half. I try to make Sangria a few hours before serving, but you can also let it sit in the fridge overnight so that the flavors mix together even more.